Insulator collecting has been a fascination of mine for nearly 30 years now. The enjoyment found in learning more about technology drives me to read and learn about the many facets of the communication and other electrical and electronic inventions and industries. Their impact on life and society as we know it today is almost beyond comprehension. Insulators are an integral part of that history and are very attractive tokens of a bygone era. 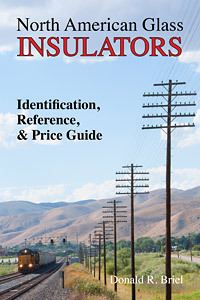 Authoring the book 'North American Glass Insulators – Identification, Reference, & Price Guide' is my way of promoting and supporting a really great hobby and the wonderful people that enjoy it. Born in Trenton, New Jersey makes me a New Jersey native, but Utah is home. I went through college working as a mason's helper. Upon earning a degree in Electrical Engineering Technology I went to work for Bell Telephone Laboratories in Holmdel, NJ. Four years later I accepted a job with Computer Information Systems, a small electronics firm in Logan, Utah, and have resided in Utah ever since. Other career employment has included working for Utah State University, Thiokol Propulsion, IT Director for Cache County, and now retired. While working, a Bachelor's degree in Computer Science and a Master's degree in Business Administration were earned. I also serve in a variety of volunteer positions in the hobby, community, and church. Jeanne and I were married in 1974. We have four children, all of whom reside in Utah. We have 17 grandchildren and 1 great grandson as of this writing. While I collect insulators, Jeanne says she collects grandchildren. However fascinating insulator collecting may be, insulators are just a hobby while our children and their families are the center of our lives. While visiting an antique shop in the early 1990s, I picked up a couple of glass insulators and began watching for more from then on. With that meager start, and a desire to know more about them, a new hobby emerged for me. Over the next few years I began learning more about insulator history, telegraph history, power transmission, etc. That research led to the discovery of several books, particularly the McDougald's publications. It also led to discovery of Insulator Collectors on the Net (ICON) and the National Insulator Association (NIA). After joining the NIA in 2000 (NIA #7218), Jeanne and I attended our first National show in Atlanta, GA in 2001. Insulator shows can really be the start of an addiction. We have been to nearly all of the National shows since that time, plus numerous smaller shows and swap meets. Since that early start, many insulators have been added to my collection, numbering about 1,000 pieces as of this writing and growing. I consider myself a CD collector, but definitely enjoy the many color and primary embossing variations. The collection also contains a sprinkling of porcelain, glass strains and spools, signs, telephones, and other go-withs. I have been privileged to serve the NIA on the Promotions committee, as Membership Director, President, and am currently serving as the Events Committee Chairman as of this writing. My largest contribution to the hobby is through continuation of the McDougald's Price Guide. My desire is to preserve the history and perpetuate the hobby in whatever way possible. I will always cherish the many friendships that have evolved through collecting insulators.